Designers Fountain Del Ray 3 Light Drum Pendant | Fountain City Art Ctr. The Del Ray Collection comes in Flemish Bronze with White Fabric glass. 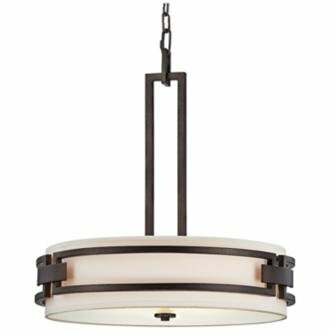 This Transitional Del Ray Pendant will complement the decor in any room of your home. Made with solid steel construction to look great and last for years to come.